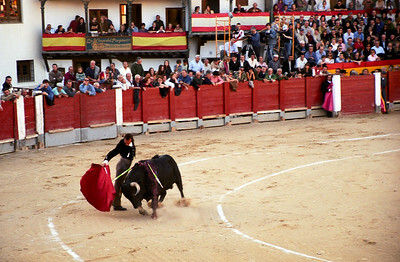 Chinchón, Spain, October 2002 - A matador faces a bull during a bullfight in the main plaza of Chinchón, Spain. At certain times of the year, the entire Plaza Mayor is converted into a bullfighting arena and people line the balconies to watch the fights take place. The Plaza Mayor de Chinchón is a classic medieval plaza from the 15th Century. 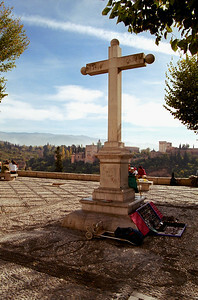 Granada, Spain, November 2002 - The Alhambra in Granada, Spain - a palace and fortress complex of the Moorish monarchs which occupies a hilly terrace on the southeastern border of the city of Granada. 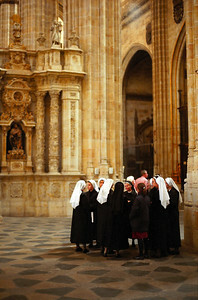 Salamanca, Spain - Nuns convene next to a pillar in the Old Cathedral of Salamanca, Spain. 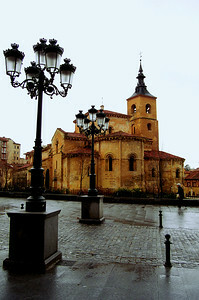 The Cathedral is also known as the Cathedral of Santa María de la Sede. 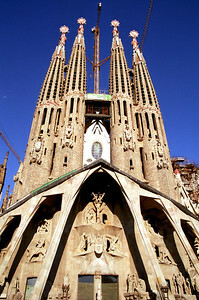 Construction began in 1140 and took more than a century to complete. 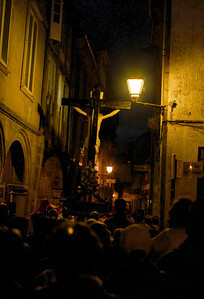 Santiago de Compostela, Spain, April 15, 2003 - Semana Santa Procession in Santiago de Compostela, Spain. 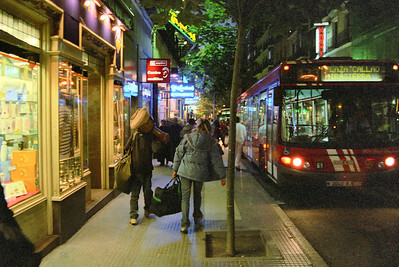 As with the rest of Spain, Semana Santa, (Easter Week or Holy Week) is celebrated with impressive processions and is the most important celebration in Spain. Semana Santa takes place the week leading up to the Easter weekend and consists of processions in which enormous 'pasos' (floats) are carried around the streets by teams of 'costaleros' (bearers) followed by hundreds of 'nazarenos' (penitents). Throughout the city thousands of people line the streets waiting to catch a glimpse of the processions as they wind there way to the streets towards the cathedral. 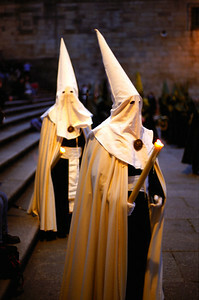 One can be forgiven for believing the Ku Klux Klan and the Semana Santa parades were borne of the same idea, since the costumes of both are practically identical. 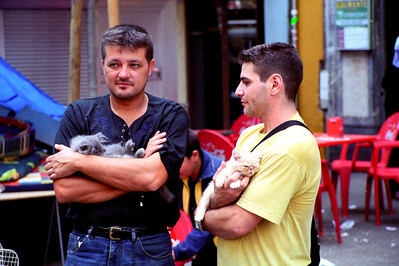 Despite this, there appears to be no connection whatsoever between the two, although the Nazarenos came first. The Ku Klux Klan used their costumes for disguise, for the Christian connotations and perhaps the fact they were usually white had a racial significance. Although there is the possibility that there were members of the Klan who had witnessed Semana Santa parades and took their inspiration from these, there is no defined link. 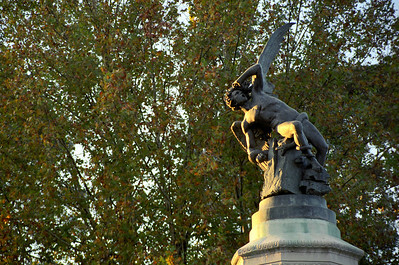 Madrid, Spain, October, 2002 - El Ángel Caído (The Fallen Angel) statue in El Parque Retiro in Madrid, Spain. It is the only known statue in the world dedicated to the devil and was carved by Ricardo Bellver in 1885. 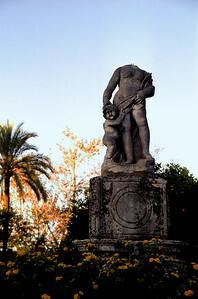 The statue was inspired by a passage from John Milton's Paradise Lost, which represents Lucifer falling from Heaven. 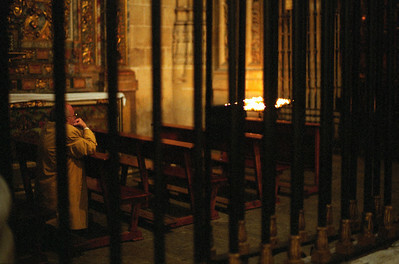 April 15, 2003 - Semana Santa Procession in Santiago de Compostela, Spain. As with the rest of Spain, Semana Santa, (Easter Week or Holy Week) is celebrated with impressive processions and is the most important celebration in Spain. Semana Santa takes place the week leading up to the Easter weekend and consists of processions in which enormous 'pasos' (floats) are carried around the streets by teams of 'costaleros' (bearers) followed by hundreds of 'nazarenos' (penitents). Throughout the city thousands of people line the streets waiting to catch a glimpse of the processions as they wind there way to the streets towards the cathedral. 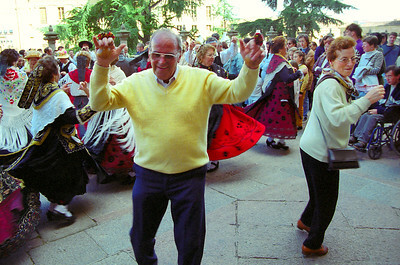 April 2003 - A young man is knocked over by a bull, while still holding his drink as he takes part in a capea outside of Madrid, Spain. 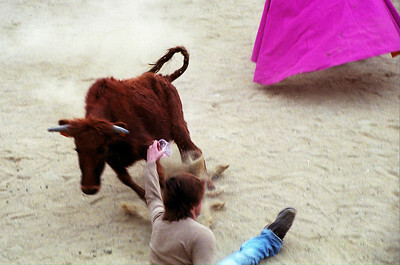 A capea is an amateur bullfight with young bulls and often takes place as part of a large party. 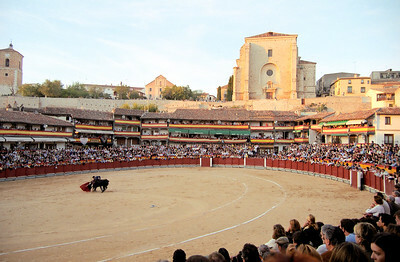 After eating and drinking, the bullfight takes place and anyone is welcome to jump into the arena. 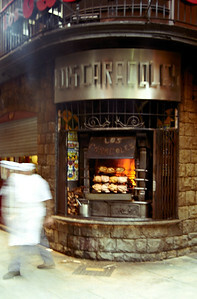 November 13, 2002 - Barcelona, Spain - Chickens roasting on a spit outside Los Caracoles restaurant in the Barri Gotic neighborhood of Barcelona. 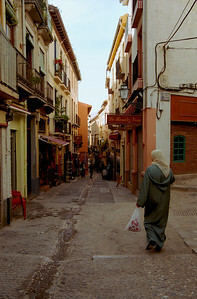 The restaurant is located on the well known street, Calle Escudellers, and draws people in with the aroma of roasting chickens. It is popular with both tourists and locals and the cuisine is Catalan comfort food: arroz negre (rice cooked in squid ink), grilled squid, and, of course, roast chicken. 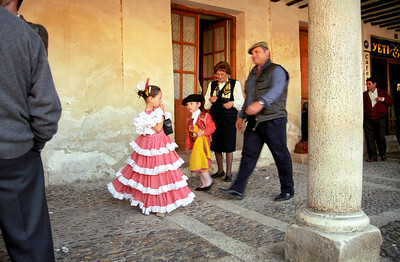 Chinchón, Spain, October 2002 - A boy and a girl are dressed up to attend the bullfights in Chinchón, Spain. 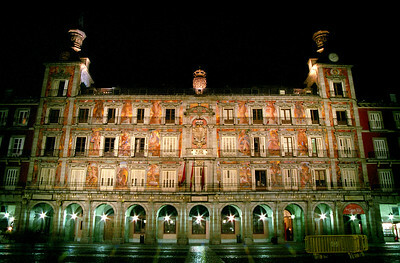 During certain times of the year, the entire Plaza Mayor is converted into a bullfighting arena and people line the balconies to watch the fights take place. The Plaza Mayor de Chinchón is a classic medieval plaza from the 15th Century. 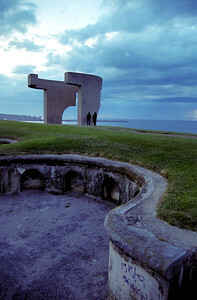 Gijón, Spain, April 2003 - Large sculpture entitled Eligio del Horizonte (Praise of the Horizon) located at Cerro de Santa Catalina, in Gijón, Spain. It was sculpted by Eduardo Chillida from concrete in 1990 and is one of 16 large sculptures placed in public spaces throughout the city in the 1990's. 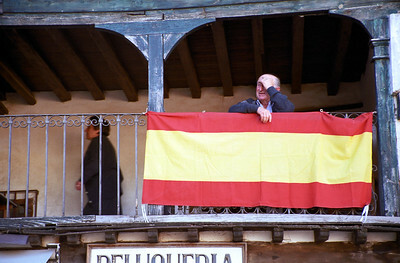 Chinchón, Spain, October 2002 - A man on a balcony overlooking the Plaza Mayor in Chinchón, Spain before a bullfight. The entire Plaza Mayor is converted into a bullfighting arena during certain times of the year and people line the balconies to watch the fights take place. The Plaza Mayor de Chinchón is a classic medieval plaza from the 15th Century. 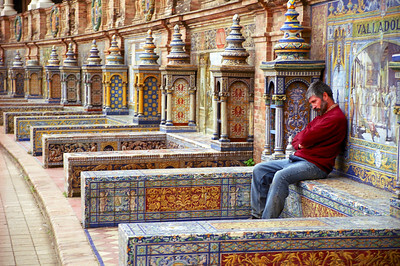 Seville, Spain, November 2002 - A man rests on an ornate bench along the walls of the Plaza de España in Seville, Spain. 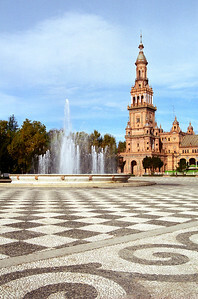 The Plaza de España was designed by Aníbal González and built in 1929 when Seville hosted the Spanish-American Exhibition. It consists of a huge half-circle with buildings continually running around the edge accessible over the moat by numerous ornate bridges. In the centre is a large fountain. 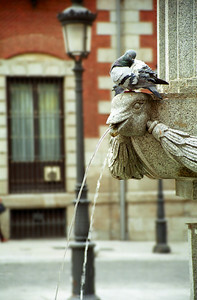 Today the plaza mainly consists of Government buildings, but the beauty remains. By the walls of the Plaza are many tiled alcoves, each representing a different province of Spain. 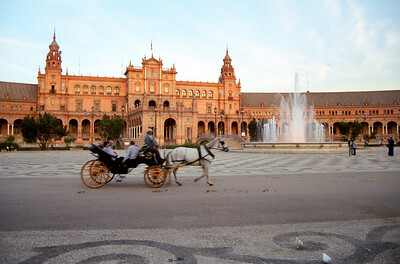 Seville, Spain, November 2002 - Horse drawn carriage in front of the Plaza de España in Seville, Spain. 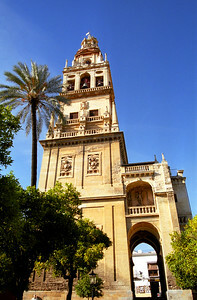 The Plaza de España was designed by Aníbal González and built in 1929 when Seville hosted the Spanish-American Exhibition. It consists of a huge half-circle with buildings continually running around the edge accessible over the moat by numerous ornate bridges. 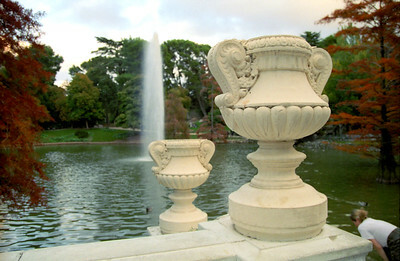 In the centre is a large fountain. 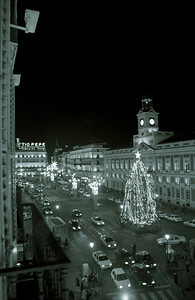 Today the plaza mainly consists of Government buildings, but the beauty remains. By the walls of the Plaza are many tiled alcoves, each representing a different province of Spain. 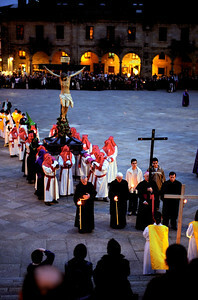 Santiago de Compostela, Spain, April 15, 2003 - Semana Santa Procession in Santiago de Compostela. As with the rest of Spain, Semana Santa, (Easter Week or Holy Week) is celebrated with impressive processions and is the most important celebration in Spain. Semana Santa takes place the week leading up to the Easter weekend and consists of processions in which enormous 'pasos' (floats) are carried around the streets by teams of 'costaleros' (bearers) followed by hundreds of 'nazarenos' (penitents). Throughout the city thousands of people line the streets waiting to catch a glimpse of the processions as they wind there way to the streets towards the cathedral. 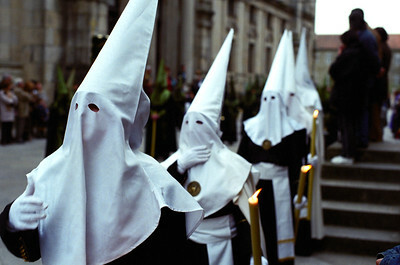 One can be forgiven for believing the Ku Klux Klan and the Semana Santa parades were borne of the same idea, since the costumes of both are practically identical. Despite this, there appears to be no connection whatsoever between the two, although the Nazarenos came first. The Ku Klux Klan used their costumes for disguise, for the Christian connotations and perhaps the fact they were usually white had a racial significance. Although there is the possibility that there were members of the Klan who had witnessed Semana Santa parades and took their inspiration from these, there is no defined link. 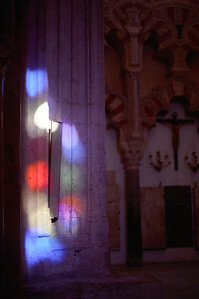 Segovia, Spain, February 2003 - Iglesia San Millán (Church of San Millan) after a rainstorm. 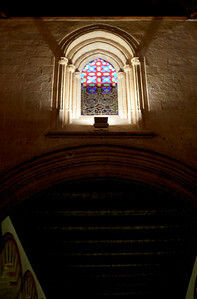 The church was built in the 12th century between 1111 and 1124 and is one of the oldest churches in the city. 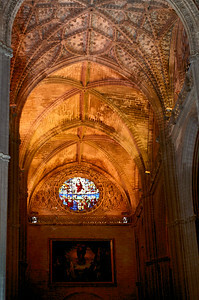 It is a Romanesque church and was ordered to be built by Alfonso, King of Aragon. 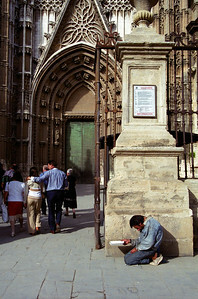 The large church dominates a spacious plaza off of Avenida de Fernandex Ladreda, which leads to the famous aqueduct and passes another Romanesque church, San Clemente. 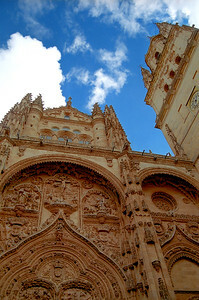 Patterned closely on the cathedral of Jaca in Aragon, San Millán is especially notable for its pre-Romanesque mozarbic tower and porticoes with abundant Romanesque figurative carvings. 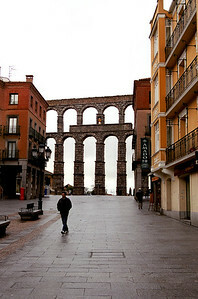 Segovia, Spain, February 2003 - A man walks on the streets of Segovia, Spain in front of the Aqueduct Bridge. 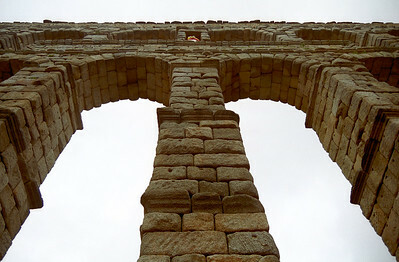 The Aqueduct of Segovia (or more precisely, the aqueduct bridge) is one of the most significant and best-preserved monuments left by the Romans on the Iberian Peninsula. 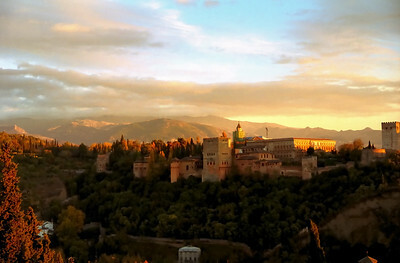 It is among the most important symbols of Segovia, as is evidenced by its presence on the city's coat of arms. At its tallest, the aqueduct reaches a height of 28.5 meters (93.5 feet), including nearly 6 meters (19.7 feet) of foundation. 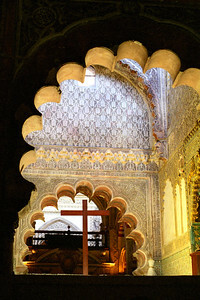 There are both single and double arches supported by pillars. It transports waters from Spring Fuenfría, situated in the nearby mountains some 17 kilometers (10.6 miles) from the city in a region known as La Acebeda. 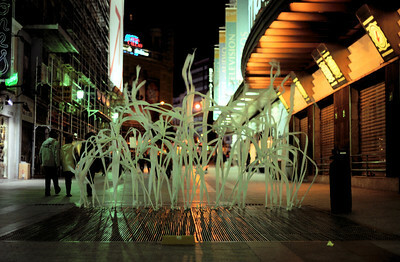 It runs another 15 kilometers (9.3 miles) before arriving in the city. The date of construction cannot be definitively determined and researchers have placed it between the second half of the 1st Century AD and the early years of the 2nd Century. 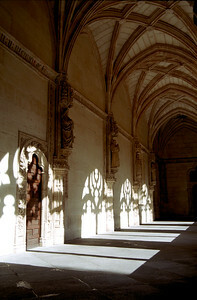 Segovia, Spain, February 2003 - The arches of the Aqueduct of Segovia, Spain. The Aqueduct of Segovia (or more precisely, the aqueduct bridge) is one of the most significant and best-preserved monuments left by the Romans on the Iberian Peninsula. 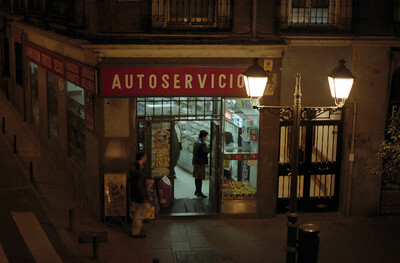 It is among the most important symbols of Segovia, as is evidenced by its presence on the city's coat of arms. At its tallest, the aqueduct reaches a height of 28.5 meters (93.5 feet), including nearly 6 meters (19.7 feet) of foundation. 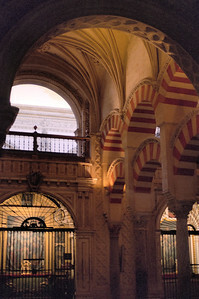 There are both single and double arches supported by pillars. It transports waters from Spring Fuenfra, situated in the nearby mountains some 17 kilometers (10.6 miles) from the city in a region known as La Acebeda. 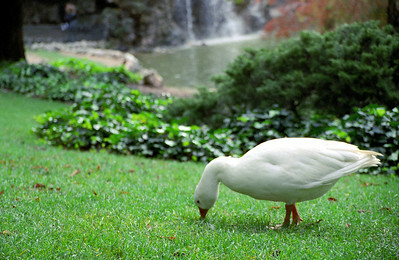 It runs another 15 kilometers (9.3 miles) before arriving in the city. The date of construction cannot be definitively determined and researchers have placed it between the second half of the 1st Century AD and the early years of the 2nd Century. 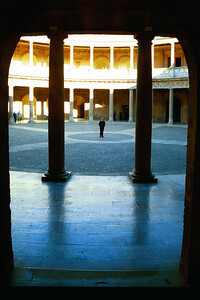 Seville, Spain, November 2002 - The Plaza de España in Seville, Spain. 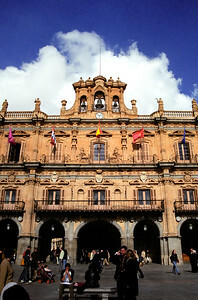 The Plaza de España was designed by Aníbal González and built in 1929 when Seville hosted the Spanish-American Exhibition. It consists of a huge half-circle with buildings continually running around the edge accessible over the moat by numerous ornate bridges. In the centre is a large fountain. Today the plaza mainly consists of Government buildings, but the beauty remains. 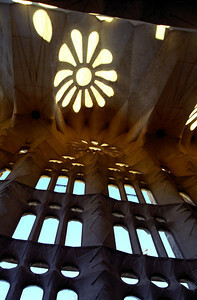 By the walls of the Plaza are many tiled alcoves, each representing a different province of Spain.